Luckily the aftermarket has a ready solution for all of the above issues. Honda used the XR650L motor in other vehicles but fortunately it didn’t use the same transmission gearing in those other vehicles. Honda used a different (lower) 2nd gear in one other bike and a higher 5th gear in another bike. To solve the first three issues listed above all you have to do is install the 2nd and 5th gears from those other bikes and then change sprocket size. The different 2nd and 5th gears fit perfectly in the XR650L transmission without having to make any modifications. The different 2nd gear can be ordered from any Honda dealer for about $35 but the different 5th gear is a Europe/Japan only part. I was able to order the 5th gear from a Japanese seller on the internet for a total cost of about $120 but more recently I have seen them for sale on eBay. Installing the 2nd and 5th gears requires splitting the cases, which is beyond my expertise so I had Erik Marquez of Marquez Racing handle this job for me. After the new gears were installed I increased the rear sprocket on my bike from the stock 45 tooth to a 48 tooth steel unit. The combined sum of all these changes produced a significantly better motorcycle. The too-wide gap between 1st and 2nd is gone and I no longer find myself having to choose between screaming the engine in 1st gear or lugging it in 2nd gear when riding on challenging terrain. The larger rear sprocket lowers the overall gear ratio for all 5 gears, meaning 1st gear is now sufficiently low and better for dirt riding. 5th gear is a little higher, lowering the RPMs and vibrations at highway speeds. Another issue with the stock XR650L motor is that it is a little down on power. 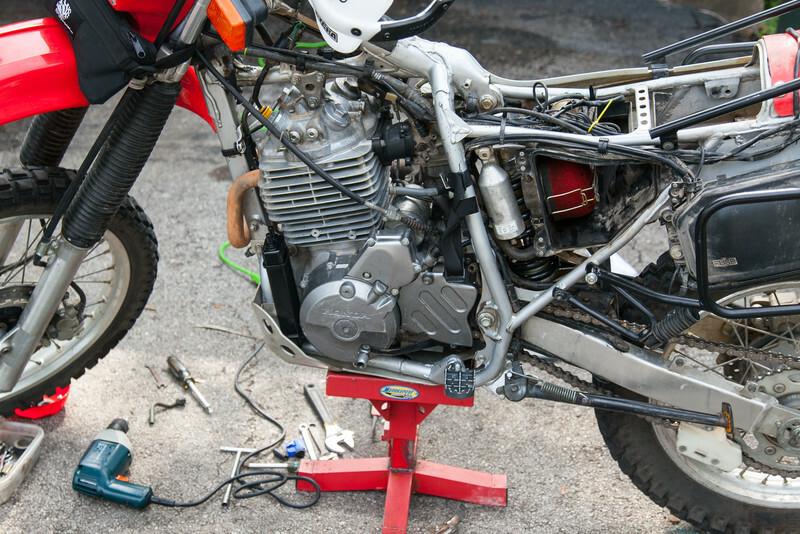 The first changes most riders make in order to get more power is change to a foam air filter, install a new exhaust pipe, desmog the motor, and rejet the carb. My bike already had all these changes done when I got it so, which was a nice advantage. Still, with 22,000 miles on the bike, my motor was tired so I opted to install a big bore kit, bringing the displacement to 675cc. The stock compression ratio is a mild 8.3:1 so as part of the big bore kit I opted for a higher compression piston which raised the compression ratio to 9.1:1. For even more power many riders choose to increase the compression ratio to 10.5:1 but I was concerned that the motor would require premium fuel if I ran a compression ratio that high. Since I plan to ride this bike in places where premium fuel is often not available I opted for the lower compression (and lower power) ratio. Before the changes my Honda was disappointingly low on power – I drag raced a friend on his DRZ and he smoked me by 20 bikes lengths. The motor and transmission mods brought my bike to life and now it runs the way I expect a 650 thumper to run. When I get a chance I’m going to drag race my buddy again and while I may not beat his DRZ I do expect to at least make a contest out of it this time. 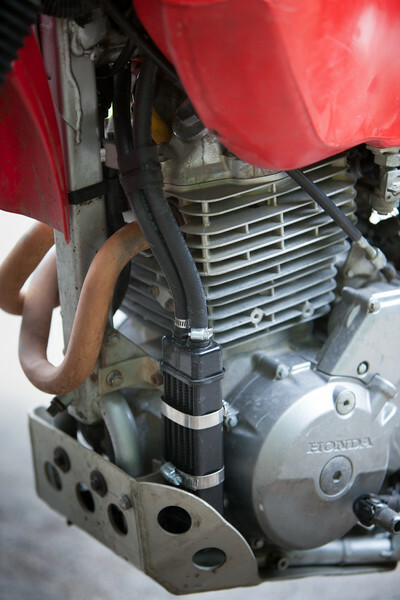 Finally, the motor on the XR650L is known to run hot at sustained highway speeds. I used an oil thermometer to see how hot my oil was getting and, sure enough, it was routinely as high as 270 degrees when riding the highway. To combat this I had an oil cooler installed, which brought the oil temps down to 240-250 degrees while highway riding. 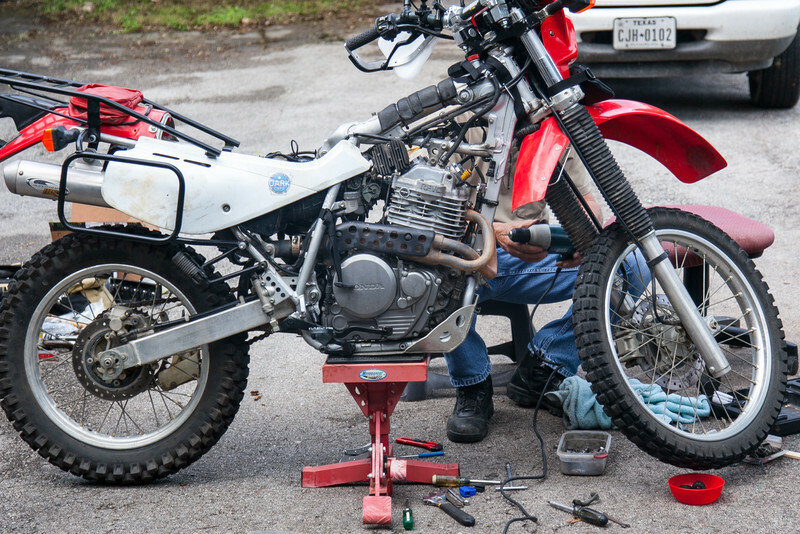 The mods make the XR650L a better adventure bike for the type of riding I do. My hot rod Honda is a more versatile motorcycle – simultaneously better in the dirt and on the highway. The motor mods have made the XR650L sufficiently powerful for my needs and the 2nd and 5th gear mods are highly recommended (especially the 2nd gear change) for anyone using the XR650L as a dual sport adventure machine. 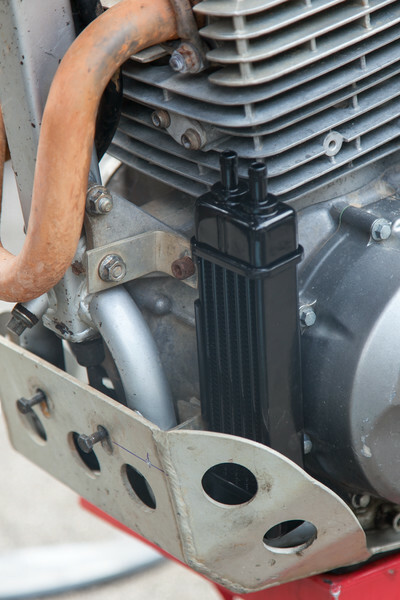 Where can I purchase the oil cooler you used on your XR? Thanks for the detailed write-up on the bike. How did it do against the DRZ after all the mods? My motor just went through almost the exact same mods (except jetted stock carb and went 10:1 compression). Podrias decirnos de que otra HONDA montaste los piñones 2 y 5 ? My Spanish isn’t good enough to understand your question. 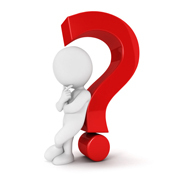 Can you ask it in English? The guy that wrote to you in Spanish asked if you could tell him from which other Honda bikes the 2nd and 5th gears came from. The 2nd gear, part number 23421-MN9-010, comes from the Honda NX650 and can be bought from any Honda dealer or online.